The Amazon basin of South America holds some of the largest snakes on the planet. The combination of the tropical climate and abundant prey species provides a perfect backdrop for the evolution of large snake species. Though long extinct, the largest snake species known is the titan boa (Titanoboa cerrejonesis) of South America. Reaching more than 40 feet in length and weighing over a ton, titan boas left fossils that were found in a Columbian coalmine. The boas lived approximately 58 million years ago, and probably lived an aquatic lifestyle much like modern anacondas. While the reticulated pythons (Python reticulatus) of Southeast Asia grow longer, large green anacondas (Eunectes murinus) are the heaviest snakes on the planet. 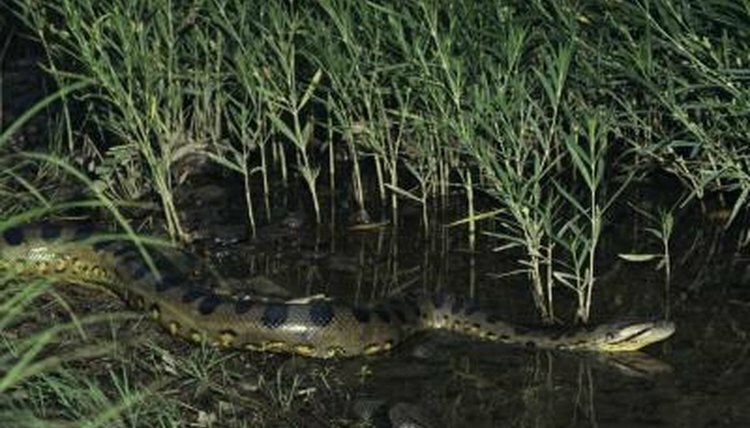 Female anacondas grow much larger than their male counterparts do, and may reach about 20 feet in length and exceed 500 pounds in weight. Anacondas inhabit marshy and aquatic areas, where they ambush prey at the water’s edge. The green anaconda is much larger: the yellow anaconda (Eunectes notaeus) reaches about 12 feet in length. Boa constrictors (Boa constrictor ssp.) are the second-largest species found in South America; some subspecies occasionally exceed 10 feet in length and 60 pounds in weight. According to breeder Erika Stockl of Boa-Constrictors.com, great variation exists among subspecies and populations, but the largest individuals are females from Peru and Columbia. A separate lineage of boas known as the rainbow boas (Epicrates cenchria ssp.) also inhabits South America. Though still large snakes, rainbow boas are not as long or heavy as boa constrictors are; rainbow boas are usually less than 6 feet in length and weigh only a few pounds. Shiny, iridescent scales cover the rainbow boas, and give the snakes their common name. Two large pit vipers occur in South America: the bushmaster (Lachesis sp.) and the terciopelo (Bothrops asper). Bushmasters are the longest venomous snake in the western hemisphere, reaching 11 feet or more in length; only the king cobra (Ophiophagus hannah), an Asian species, is longer. Bushmasters are somewhat heavy-bodied, and average 8 to 12 pounds. Terciopelos, which are also called fer-de-lances, are somewhat smaller than bushmasters; terciopelos are usually less than 6 feet long, though large specimens exceed 8 feet and 13 pounds. Bushmasters prefer to live in undisturbed forests, and are rarely encountered by humans; by contrast, the terciopelo is often found near human habitation, and is responsible for a high number of bites each year. Most colubrids—sometimes called "typical snakes"—are small species that rarely exceed 6 feet in length. Three colubrid snakes found in South America routinely grow larger than this: the cribo (Drymarchon corais), the false water cobra (Hydronastes gigas) and the giant bird snake (Pseustes sulphureus). False water cobras—named for their habit of hooding when frightened—prefer living in wetlands, where they prey on amphibians. Giant bird snakes are predators of rodents and birds that are equally at home on the ground and in the trees. Cribos are powerful predators: rather than using venom or constriction to kill their prey, these terrestrial snakes kill their prey with jaw pressure or by holding the prey in their mouth and beating it on the substrate or nearby objects. Giant bird snakes are likely the largest of the three, occasionally exceeding 10 feet in length. By contrast, the cribos and false water cobras are seldom more than 8 feet in length.